While you might never be bothered to fly with your mountain bike to enjoy your mtb experience, real trail-junkies unless offered the same bike they own, they will never part with their beloved rigs. Since distant travels are most economical and quickest by plane, we are going to briefly talk about squeezing your mountain bike in a bike bag, bike case, or a cardboard box, and flying with it. Traveling with our bikes has got easier over the years with many airlines offering a real bargains on carrying sport equipment, and a few even won’t charge you at all (Virgin Atlantic doesn’t charge for sports equipment). Whether you opt for a bike bag, bike case or ordinary cardboard box, it will depend on the amount of travelling you do, and the type of bike you want fly with. Each has its advantages and disadvantages. Most people choose to travel with their own bikes simply because they are used to it. It’s always best to know the mountain bike you’re on and be confident in its abilities or limits. Opt for a rental and you may find yourself somehow uncomfortable and restricted in your riding abilities. You’ll already be riding foreign trails, do you really want to sit on an unfamiliar bike? Despite all the fees associated with airline bike travel and price of accessories, you’ll still probably end up saving money by flying with your own bike (in most cases), especially if you’re planing to go on mountain biking holidays more than once. Depending on the country, the length of your trip and the mtb you want to ride, you could end up paying from £30 to £80 a day for a rental, whereas airlines will generally charge roughly £20-£50 each way. Accidents can happen no matter if you are riding your own or rented bike. 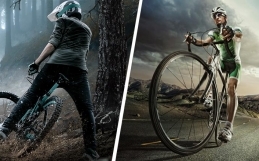 The only difference is you could be hit with a hefty bill if your rental shows signs of damage that could cost you only a fraction of money if it was your own bike. BIKE BAG, BIKE CASE OR CARDBOARD BOX ? 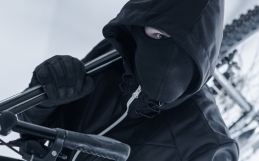 Bike Bags will differ and this difference will usually be determined by their price. From cheap bags offering little room and protection to more expensive ones giving you extra room and security for your bike. They are also very popular due to the fact that they’re easy to handle and store when not in use. If you plan to fly with your mountain bike more than once, need comfort and good protection for your bike, then a quality bike bag offers unrivalled value. 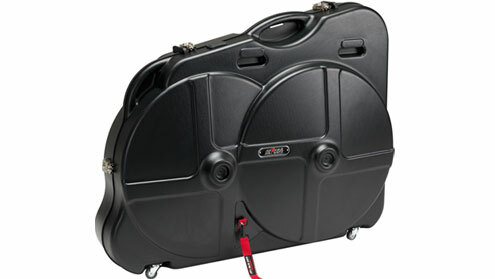 The hard shells or bike cases offer the best deal of protection of all three. But they can be cumbersome to transport around, they’ll have the least extra space, and won’t be cheap to buy. If you travel a lot and want your expensive bike to have the very ultimate in protection, investing in a hard case would make a lot of sense. 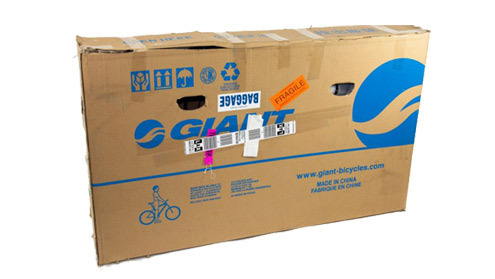 If you fly with your mountain bike once in a blue moon, or you are on a tight budget and can’t afford to buy a bike bag or a bike case, try asking your local bike shop if they have any spare cardboard bike boxes. A sturdy cardboard box is often inexpensive and easy to access, easier to handle, and is usually lighter than most bags and cases. Plus, you can leave your back wheel in the bike frame inside the box so it’s better protected. But It also requires a lot of extra protective packaging to secure your mountain bike and is very time-consuming to pack and unpack. 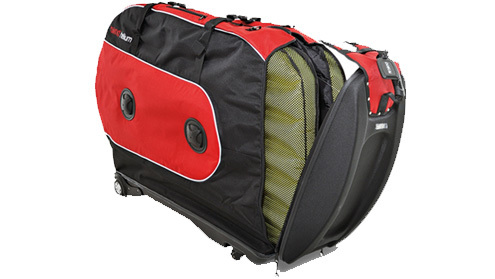 Make sure the bike bag or bike case has enough room to fit you large frame and 29 inch wheels. Not all bike bags will be big enough to fit your bike in without taking it apart to pieces. Not having to remove fork, enough room to fit a fully inflated tubeless big wheels… all these will make your life easier. Soft bags with wheel compartments or accessory wheel bags are worth the money. Some well designed bike cases will have secure wheel mounts in the sides separated from the main bike compartment. Again these are the perks to look for on a quality bag or case. Ripstop fabrics are using a special reinforcing technique that will make your bike bag resistant to tearing and ripping. Plenty of foam will keep your machine safer from careless baggage handlers. 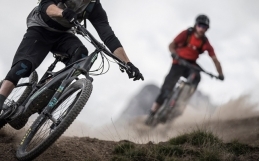 A case or bag with plenty of accessory straps and mounting points will also ensure some safety from being shaken around inside which could cause accidental damage to your mountain bike. The more handles and grips to grab your bag the better. Shoulder strap for getting upstairs will be useful too. 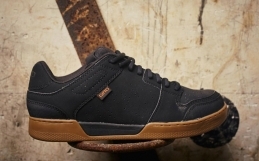 Wheels will be ideal for scooting through airports. Look for wheels that are either encapsulated into the base, or set into big recesses. Wheels that stand proud are less secure and often get broken off. Cases that offer single or even better multiple locking points will be the most secure. Soft bags won’t have the same level of security as hard cases.